Astronomers have known for decades that supermassive black holes at the cores of galaxies can shoot out jets of subatomic particles at tremendous speeds. However, details about the physics of such jets, including how they are generated, how the high-speed flows are shaped into jets, and how fast the particles are moving, among many others, have remained elusive. An international team of researchers now is making an unprecedented long-term study of the motions of these giant jets, using the super-sharp imaging capabilities of the National Science Foundation's Very Long Baseline Array (VLBA). "We're making images of 200 galactic jets at regular intervals, tracking their motions and studying their magnetic-field properties. This is making major contributions to our understanding of such jets," said Matthew Lister, of Purdue University. The research team has produced time-lapse movies of 100 of the jets, allowing measurement of the speed and direction of motion. "The results of these VLBA observations are going into a rich and still-growing set of data that is available to the entire astronomical research community as a tool for understanding the many unresolved questions we have about these jets," Lister said. 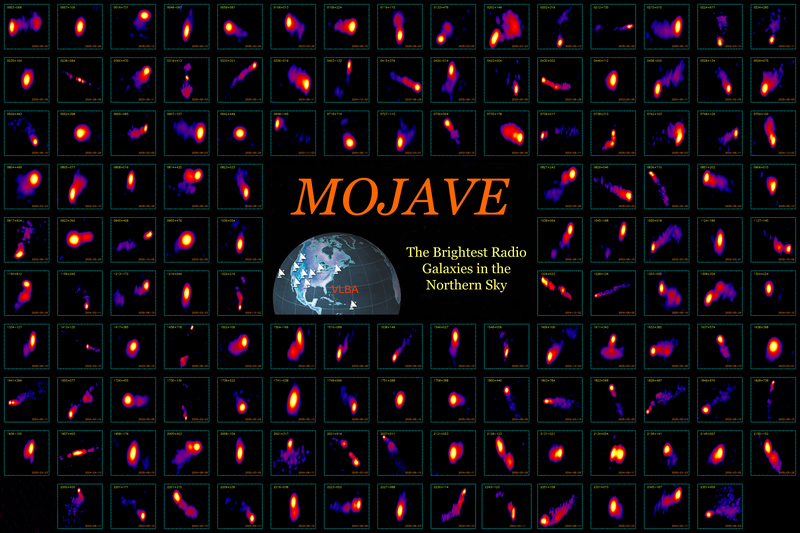 The jet study is called MOJAVE -- Monitoring Of Jets in Active galactic nuclei with VLBA Experiments -- and began in 2002. It is a successor to an earlier VLBA study that regularly made images of nearly 200 jets from 1994 to 2002. The jets are powered by the gravitational energy of black holes containing hundreds of millions times more mass than the Sun. Black holes are concentrations of mass so dense that not even light can escape them. As these monsters draw material toward them, the material falls into a circular disk orbiting the black hole. The jets are propelled outward along the poles of the disk. The MOJAVE movies have given astronomers some surprises and also have spurred follow-on studies of individual objects. "Before the VLBA was built, we were hindered in our studies of extragalactic jets by the lack of a facility that could do high-quality, regularly-spaced images showing very great detail. The VLBA's capabilities have made it a premier facility for studying these objects out to very large distances, and thus getting a large sample," Lister said. The MOJAVE observations are showing new details about the structures of magnetic fields in the jets. This is important, because magnetic fields are thought to play vital roles in the acceleration of the particles and in shaping the jets. The time-lapse movies have revealed a variety of interesting behavior in the jets. For example, the powerful radio galaxy called 3C279 emitted a bright feature that moved along a straight path for 15 years, then suddenly brightened, showed a change in its magnetic field, and sped off in a new direction. Other jets shoot successive bright features that move outward in curved paths. Some features in jets are seen to break apart. "These detailed movies of complex motions are real-world data that allow researchers to refine their computer simulations of the jets, leading to a far better understanding of the physics involved in such impressive cosmic particle accelerators," Lister said. The MOJAVE data will prove valuable for comparison with the gamma-ray information to be collected by NASA's upcoming GLAST satellite. "Using the MOJAVE data along with data from other ground-based and orbiting observatories at different wavelengths is bringing the studies of galactic jets into a new era," Lister concluded.